Container Services | Standard Iron & Metal Co., LLC. Contact us if you are in need of an industrial container for your facility. We have a variety of hoppers, bins, roll-off containers and trailers which we provide to the industrial, commercial and government sectors to accommodate your one time clean up or regular production needs. Upon request, we will visit your location to help place the container(s). 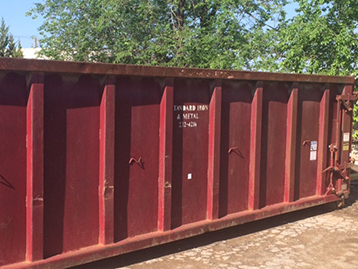 You may schedule regular pick-ups or simply call when the container is full. We understand that a full container can not get in the way of your manufacturing and production process, and our fleet of trucks is ready for prompt drop off and hauling services. Copyright © 2015, Standard Iron & Metal Co.